Whilst at the Imperial War Museum, I also took in the exhibition on Women War Artists, which is on until November 27th. It’s quite a small (free) exhibition, but includes some diverse and interesting paintings that demonstrate aspects of women’s engagement with war throughout the twentieth century. There are paintings which depict women war workers, such as Laura Knight’s famous Ruby Loftus Screwing a Breech Ring (1943), right, and Flora Lion’s Women’s Canteen (1918), left, as well as some lovely individual portraits by Victoria Monkhouse. Each painting is accompanied by a brief discussion of the role of women as depicted in the painting, making it a very informative exhibition. There are, of course, paintings by women who went into war zones, using the title ‘Official War Artist’, commissioned during the Second World War (before then women could not use this title). Some of the paintings, such as those by Linda Kitson, were actually commissioned by the Imperial War Museum, when she went to the Falklands with the troops – the first time a woman artist had been able to do this. There are other battlefield images, but after the battle: Olive Mudie-Cooke’s images of the Somme and the Italian Front, for example. Another very moving painting, and very famous, is Laura Knight’s The Nuremburg Trial (1946) – a very powerful painting which combines the stillness of the courtroom with the horrors of war. The pictures included in the exhibition record hospitals, sites of battles, ships, farms, a forge, factories, and the home front, such as Evelyn Dunbar’s The Queue at the Fish Shop (1944), below, a reminder of the hardships of life away from the heat of battle. 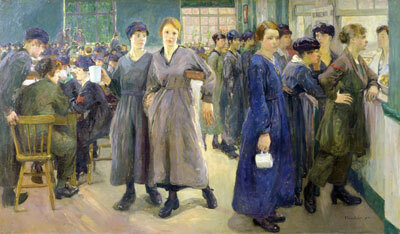 The exhibition certainly shows an unofficial side to war as well as the development of the professional woman war artist. As the notes to the exhibition say, the cost of war is clearly counted in these pictures: ‘homelessness, exile, occupation, deaths and atrocity’ all feature, as well as experiences of the Blitz. Well done, Imperial War Museum. This is a topic I had been particularly interested in, when searching for WW1 paintings. It seemed as if women had a tough time being taken seriously, presumably by their husbands or fathers in the first place, and then the army in the second place. So it was a huge success to produce completed works about the war _at home_. Were any women artists allowed to visit battle sites, even during the active war years or soon after? Yes, it seems that a (very) few visited battle sites shortly in WW1, but not, as far as I know, in an official capacity. Olive Mudie-Cooke’s paintings are an example of paintings of battlefields, but she was there in her capacity as a volunteer ambulance driver rather than officially as an artist. Apparently in WW1 four women artists were commissioned by the War Art Commission, but their paintings were mostly of the home front – and were mostly rejected anyway! According to the notes I made, in WW2 48 of 300 commissioned artists were women, but only 2 got to go abroad.